We opened our doors to the public for the first time on Mon 4 October 1999. Our first performance was The Magic of the Musicals on 16 October 1999. Our ‘official’ opening was on 12 November 1999 by Dr James McDaid, TD, then Minister for Tourism, Sport and Recreation. A competition was held to name the theatre. The winning entry came from Margaret McGinley, mother of actor Sean McGinley and a renowned musician in her own right. So what does the name mean? An Grianán means ‘sunny place’ or ‘sun palace’. With our glass fronted facade we truly are a sunny place for lunch when the sun comes out! 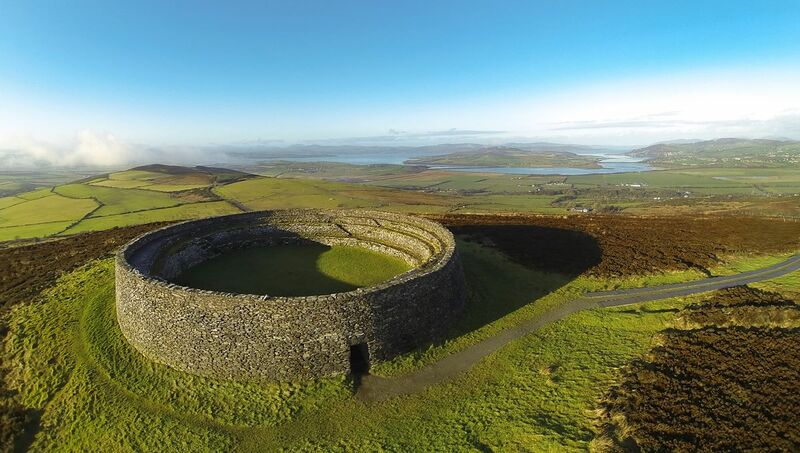 We would never be so presumptuous to call ourselves Ireland’s most famous ‘Grianán’ as that honour firmly belongs to Grianán of Aileach (‘Stoney House of the Sun’), a prehistoric ring fort believed to date back to 1700BC. It’s located in Burt about a 20 minute drive from Letterkenny. We highly recommend a visit as the view from it is simply stunning! The theatre came about as a result of a sustained community campaign – you can find out more about it here. 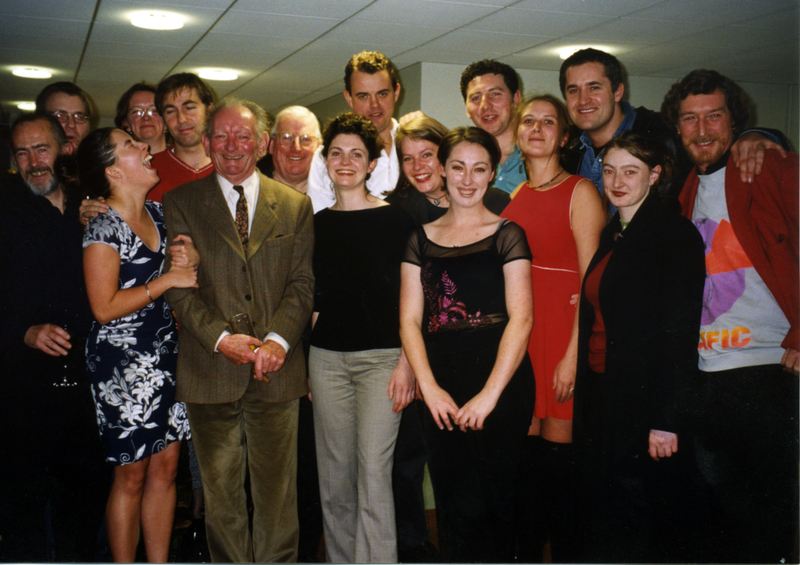 Our first ever inhouse touring production was Brian Friel’s Translations in November & December 1999. Highland Radio’s Shaun Doherty played The White Rabbit in Alice’s Adventures in Wonderland, our first Christmas show. Our auditorium originally had seating for 343 patrons but in 2007 we decided to redesign our seldom used orchestra pit and added extra seats to bring our capacity up to 383. The seats are removable so we can still use the orchestra pit as and when needed. Comedy! We love live comedy and we’ve been very proud to host some the best comedians in the world including Bill Bailey, Emo Philips, Johnny Vegas, Ruby Wax, Jimmy Carr, Tommy Tiernan, Dylan Moran and Rich Hall. Award winners: we’ve had Academy Award winners and Tony Award winners grace our stage. In 2008 we had Glen Hansard and Marketa Irglova aka The Swell Season who won Best Song at the 2008 Academy Awards for their song Falling Slowly from the movie Once. In 2000, we had the multi Tony Award winning Druid Theatre/Royal Court co-production The Beauty Queen of Leenane which starred the late, great Anna Manahan in the first of several plays she performed at An Grianán. She won Best Actress at the 1998 Tony Awards for this memorable production. And TV fans! Here’s some trivia for you. Kate Burton, who starred as Anna Manahan’s daughter in The Beauty Queen of Leenane, played Nick’s aunt Marie in the NBC horror drama Grimm. Not the only famous daughter to grace our stage: Kate Burton is of course the daughter of Richard and in 2002 we had Kate O’Toole, daughter of acting legend Peter, star as one of the Mundy sisters in our own award winning production of Dancing at Lughnasa. Our 2002 production of Dancing at Lughnasa was awarded an Irish Time Irish Theatre Award for Best Actress for Eleanor Methven. Our company logo was awarded a European Design Award in 2007 – find out more about our logo here. We’ve toured a show all the way to Romania. The Witchin’ Well was a play for children written by Joe Brennan and produced by us in 2005. As well as enjoying two national tours, The Witchin’ Well was also invited to the Romanian International Theatre Festival for Children where it was performed at the Ion Creanga Theatre in Bucharest in October 2006. Letterkenny Town Clock – In the spring of 2014 An Grianán became the home of the official town clock for Letterkenny! Installed in April 2014 and officially unveiled on Sat 17 May 2014, the clock was part of a programme of renovationsto the front of the building initiated by former town mayor Paschal Blake. The clock was designed by local artist Christy Keeney and constructed by Father and Son team Paul and Christopher Hynd from Joe Bonnar Metalcraft Ltd. All Back to the Future jokes are most welcome. 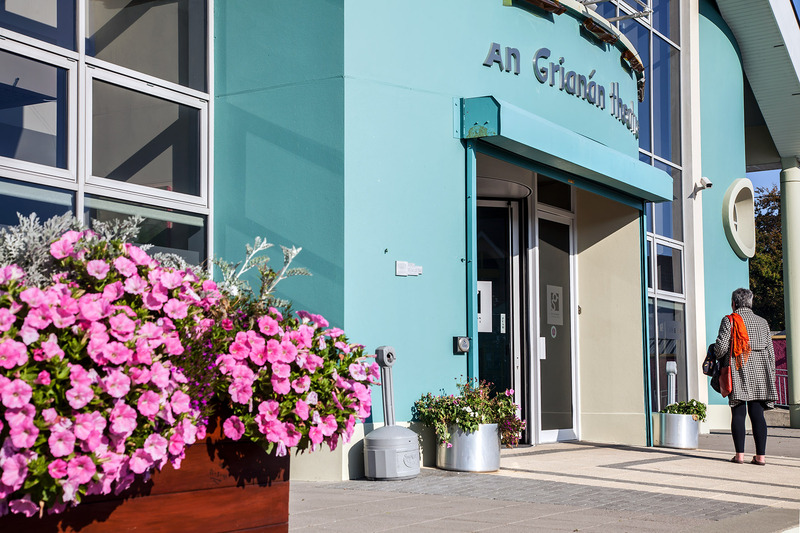 Flowers outside the entrance to An Grianán Theatre. Photo by Paul McGuckin. 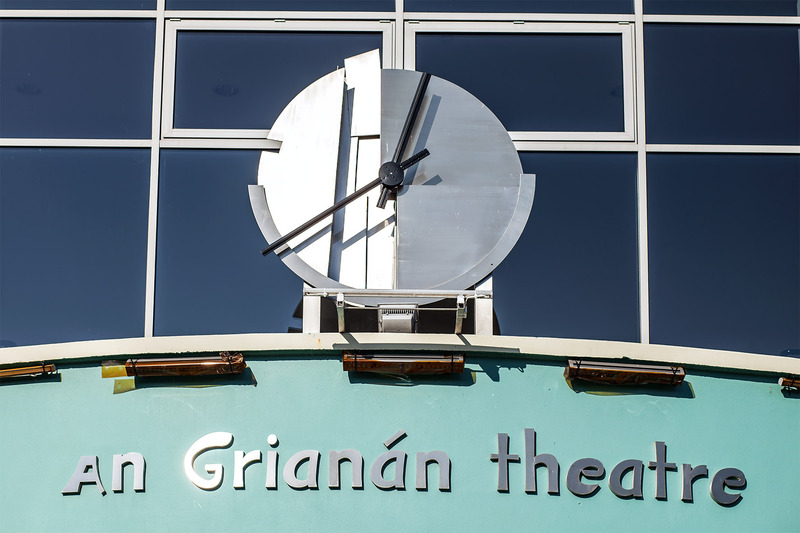 The Letterkenny Town Clock at An Grianán Theatre. Photo by Paul McGuckin. Your ticket for the: Did you know?